Kimi Raikkonen has re-signed for Lotus, the team confirmed in a special promotional video on Monday morning. The 2007 Formula 1 world champion, who returned to the sport at the beginning of this year after two seasons competing in the World Rally Championship, currently lies third in the 2012 drivers’ standings. The 33-year-old had long been expected to remain with Lotus for a second season. The team had an option for 2013 based upon certain performance criteria being met, which it has achieved comfortably. Despite not winning a race on his return, Raikkonen has impressed with six podium finishes and has attained remarkable consistency, scoring points in every race except the Chinese Grand Prix and completing every racing lap in 2012 so far. 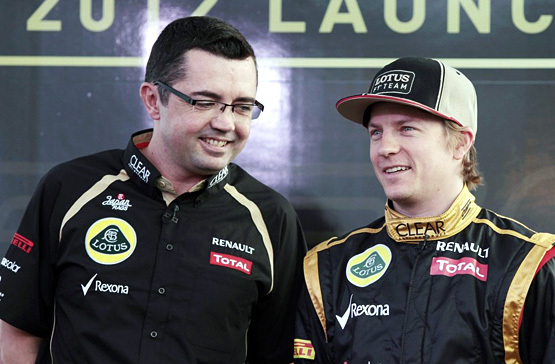 Lotus F1 Team is pleased to announce that Kimi Räikkönen will continue to drive for the team in 2013. Kimi, who currently stands in third position in the FIA Formula 1 World Drivers’ Championship, returned to the sport in 2012 after two seasons away and immediately showcased his pace, stepping on the podium six times so far this season – in Bahrain, twice in Spain (Barcelona and Valencia), Germany, Hungary and Belgium. Kimi has already started giving his input on next year’s car, the E21, and will play an active role in the whole design process. Lotus have gone backwards since the break. Besides, there were no other teams for him to join in any case. Kimi always said he wants to win, but alas not once this year. Lotus F1 should be thankful that at least they have perhaps only one good thing in their arsenal – The Iceman! Absolutely, for me Kimi is one of the drivers of the year. A great job. No fuss. Solid quality performances. Only Fernando Alonso has impressed me more, dragging his Ferrari to stratospheric feats. Wonderful! – one more year with Kimi in F1!!! The faces with the smile talks about a comfortable climate and constructive working relationship between Kimi and the team – that´s fantastic! And I´m sure, this cooperation will offer the very best results one day – maybe even earlier as we could expect:) Good luck……..
More? 300m euro Ferrari with custom built engine vs 150m euro with non-predefined team order Lotus?